A collection numbering over 500 swords, maps, muskets, flintlock pistols, blunderbusses, coins, crucifixes, daggers, armor, cannon, ship models, bottles, drinking vessels, native Caribbean Indian artifacts, etc., from the time of Columbus through the 18th/19th Centuries. One of the least-known forms of folk art is Patriotic Military Folk Art (Trench Art & Sailor Art- Naval Scrimshaw) that reached the height of its creativity in World Wars I & II. Literally thousands of Soldiers, Sailors and Marines often found themselves with idle hours between battles, and vented their pent up creativity by making various Folk Art objects which collectors today call Òtrench artÓ or Ònaval scrimshawÓ. Readily accessible to almost everyone were spent brass cartridges and shell casings which were often ingeniously decorated with, or fashioned into, miniature brass airplanes, submarines, rockets, tanks, American Flags and military insignia of every kind imaginable. 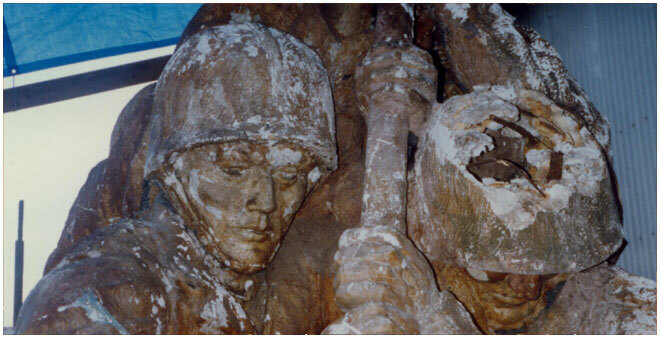 In our opinion, this battlefield art form best captures the common soldier, sailor and airmanÕs expression of patriotism, and these relics are a nostalgic reminder of the brave deeds of our servicemen and women. It has taken over 35 years to put together this collection which now numbers over 1000 pieces and is reputed to be the finest in the United States. This is a unique sub-collection mainly consisting of Òtrench artÓ crucifixes and sculptured brass shell casings made during World War I and II on the battlefields of Europe by soldiers who developed Òfox hole religion.Ó It includes some pieces actually signed and dedicated to the soldiersÕ churches back home. This collection about 1,000 pieces emphasizes uniforms, medal groupings, original sailorsÕ photo albums, submarine and torpedo models produced as shipyard, Navy and crew presentation pieces (often made by submariners themselves). They are wartime models, not toys or kit models, from all of the submarine fleets of the United States, England, France, Italy, Japan and Germany in both World Wars and the Cold War. The models range from an oak on-board, crew-made model of the World War I U-35 presented to its captain (the leading sub ace of all nations in both world wars), to a solid bronze U.S.N. fleet sub from World War II that is 38Ó long and weighs over 50 lbs. The collection includes over 200 sub models and believed to be the largest in the United States. Medals, insignias, plaques, uniforms, war flags, instruments and equipment, paintings, navigation charts, Òsubmarine scrimshawÓ and many other items round out this collection. The aviation collection emphasizes two areas. The first is the Battle of Britain, and in this category, this diversified collection of memorabilia includes over fifty model planes made out of melted down bronze from shell casings and aluminum from shot down German fighters and bombers. Also included is an original RAF Squadron Battle flag and a half dozen sterling silver, hand-painted, enameled cigarette cases with exquisite miniature color paintings of the pilotÕs Spitfire and other planes. The second area of the collectionÕs concentration is a group of fighter and bomber models made during World War I and World War II by soldiers and airmen on both sides of the war. Others are training models, aircraft identification models, presentation models and manufactureÕs desk models. The collection consists of over 100 plane models. The largest group is of USN carrier aircraft which saw service in the Pacific Theater. There are also a fine solid Sterling Silver model of a B-29; and, the Original co-pilotÕs personal copy of the Enola GayÕs log book sent home to his mother and father describing the dropping of the Atomic Bomb on Hiroshima in 1945. This collection consists of over 400 ship models Òscratch builtÓ by sailors from various Navies while aboard ship. Also included in this collection are several large-scale Òteacher classÓ identification models of U.S. and British warships made for the Admiralty Staff of the Japanese Navy in World War II with teakwood decks and an unusually high level of detail. Sizes range from 2Ó to 9 ft. long. There are also a group of original WWII aircraft carrier launching models cast of aluminum or bronze by the shipyards and given to dignitaries at the launching ceremonies. During both World Wars almost everyone smoked, and so it comes as no surprise that one of the most popular folk art objects created by our servicemen were ashtrays, cigarette cases and lighters. Readily accessible to almost everyone were spent brass cartridges and shell casings which, when cut off near the bottom, formed natural ashtrays. Everyone from Marines on Iwo Jima to Admiral ÒBullÓ Halsey had their own customized ashtray, and these were often decorated with miniature brass airplanes, submarines, rockets, American Flags and military insignia. This collection now numbers over 350 pieces. This outstanding and inspiring collection truly constitutes a national treasure. 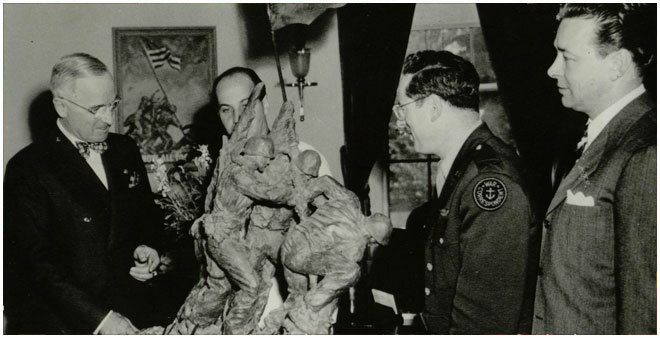 It includes the following highlights:á The Original First Sculpture of the Iwo Jima Flag Raising made by Felix de Weldon in 1945 while the battle on Iwo Jima was still raging. This model was only recently discovered, having been lost since 1945. It has been painstakingly restored using period photographs supplied by the artist and the national Archives. á The Original BuilderÕs Model of the Iwo Jima Monument which was scaled up to produce the 100-ton bronze Marine Corps Memorial completed in the 1050Õs. An original bronze of this plaster original is also in the collection and was recently on loan to The National Portrait Gallery of the Smithsonian Institution in Washington, D.C.á The recently rediscovered and excavated 20 foot, 10 ton Original First Monument of the Iwo Jima Flagraising was made in the closing days of World War II for the 7th War Loan Bond Drive in 1945. 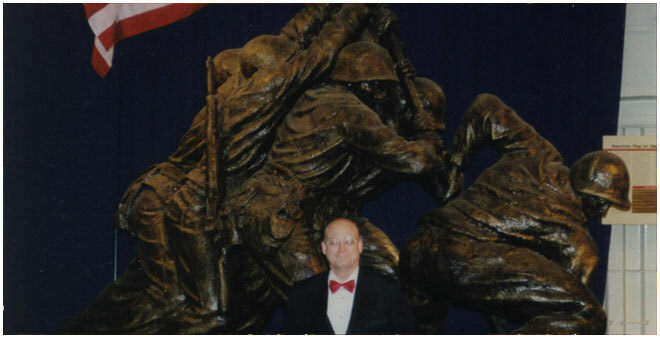 It stood in front of the Department of the Navy Building (now the Federal Reserve Bank Building) in Washington, D.C. Having been ÒreplacedÓ by the 80 ton bronze Marine Corps Memorial in Arlington, the monument was abandoned behind an 18th century building on outskirts of Washington, D.C. which was once used by sculptor Felix de Weldon to build both it and the Memorial. Rodney Brown purchased the crumbling remains from de Weldon. A construction crane was needed to move the crumbled and broken pieces. 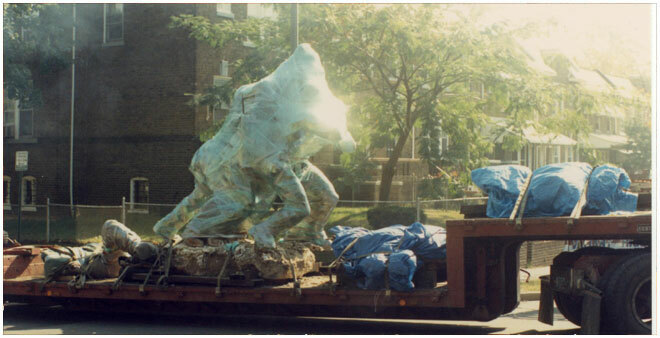 It was moved by flatbed truck to Princeton, N.J. and restored under the direction of Alex Ettl, founder of Sculpture House Castings, one of the nationÕs oldest fine art foundries. 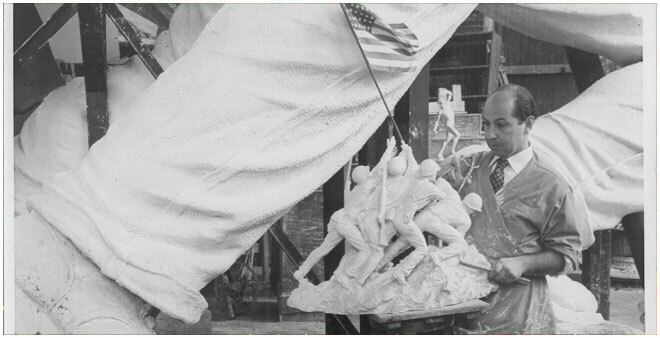 The War Museum found the monumentÕs supervising sculptor, Bill Petsco, who worked for Felix de Weldon during World War II. Bill was coaxed out of retirement to assist in the restoration (which took over 5 years). 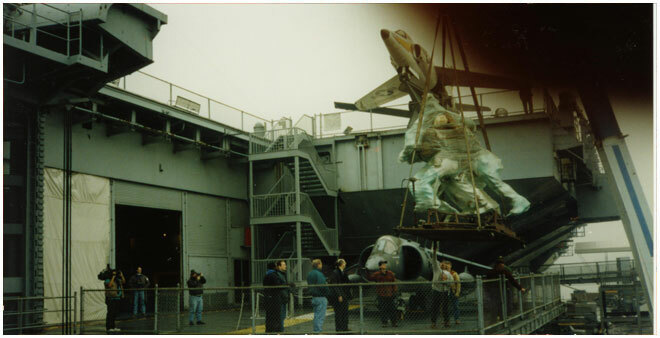 From the studio in New Jersey, the statue was taken to the Intrepid Sea, Air and Space Museum in New York for finishing touches. 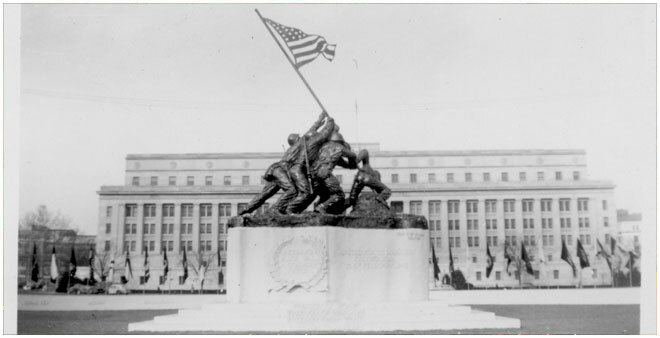 On February 19, 1995, exactly 50 years to the day since the flag raising on Iwo Jima, the statue was re-unveiled to the public by Lt. General R.D. Hearney, Assistant Commandant of the Marine Corps. ÒThat battle came to symbolize all that is good about our country and our Corps,Ó Hearney said. ÒThe story should be told again and again to our children and our grandchildren. It is a story simply about courage.Ó Today, about 500,000 people each year visit the monument on board the Intrepid where they learn about their Marine Corps and this key battle in U.S. history.á The bloodstained Japanese Battle Flags captured on Mt. Suribatchi by U.S. Marines on their way up to raise ours.á Japanese Samurai swords and knives captured on Mt. Suribatchi and Death Valley on Iwo Island.á Captured Japanese helmets and equipment hand-painted by U.S. Marines.á Original photographs from the battle including several lost photographs of the Flag Raising taken from a U.S. fighter that happened to be artillery spotting overhead at the exact moment of the Flag Raising.á A Collection of Iwo Jima sculpture models by Felix de Weldon which show the evolution of the famous statueÕs design and how it changed from the position in the original photograph taken by Joe Rosenthal into the later design showing a closer, more unified action and purpose.á Original Joe Rosenthal photographs, including his complete, original Iwo Jima album showing every shot on the roll of film he took climbing the mountain on that memorable day.á The Japanese CommanderÕs defense map of the island showing troop and gun emplacements, beach defenses, etc. in Japanese. (and his map case) found in the cave with his body.á U.S. Marine Corps theater-made combat knives used on Iwo – some of the most deadly knives ever made and used in hand-to-hand combat. á Many other memorabilia too numerous to mention, but in total about 150 items. This is a collection of over 500 combat knives from the trenches of World War I to the Jungles of the South Pacific in World War II, the Korean War and Vietnam. The collection contains a selection of standard issue knives, including the only known WWII Camillus USMC stiletto with the USMC scrolled engraving on the blade in gold. The bulk of the collection is made up of battlefield or theater-made knives crafted by the Marines themselves, often using captured enemy materials. They include Marine Paratrooper knives, the largest fighting knives ever carried into combat by any U.S. fighting forces. Size does matter! The sword group includes several rare early period Mamaluke swords. This is a study collection consisting of well over 200 wartime graphic artworks with emphasis on the artist being a common soldier or sailor during World War I or II, rather than the work of a professional or commercial artist of the period. All aspects and theaters of war are covered in various media (oil paintings, lithographs, original photographs, etc. ).